Enzymes are biological catalysts. They are specific to one type of reaction and to one or a small group of reactants called substrates. A catalyst speeds up the rate of a reaction without being changed itself. They are necessary as most biological reactions are very slow. Kinetics is the study of reaction rates. This will be considered in the context of enzymes where the rate of the reaction means the rate of product formation. In this article we will look at the structure, function and clinical significance of enzyme kinetics. Most enzymes are globular proteins with the exception of a few RNA enzymes (ribozymes). They have an active site made up of a few amino acids. This is where the reaction occurs. 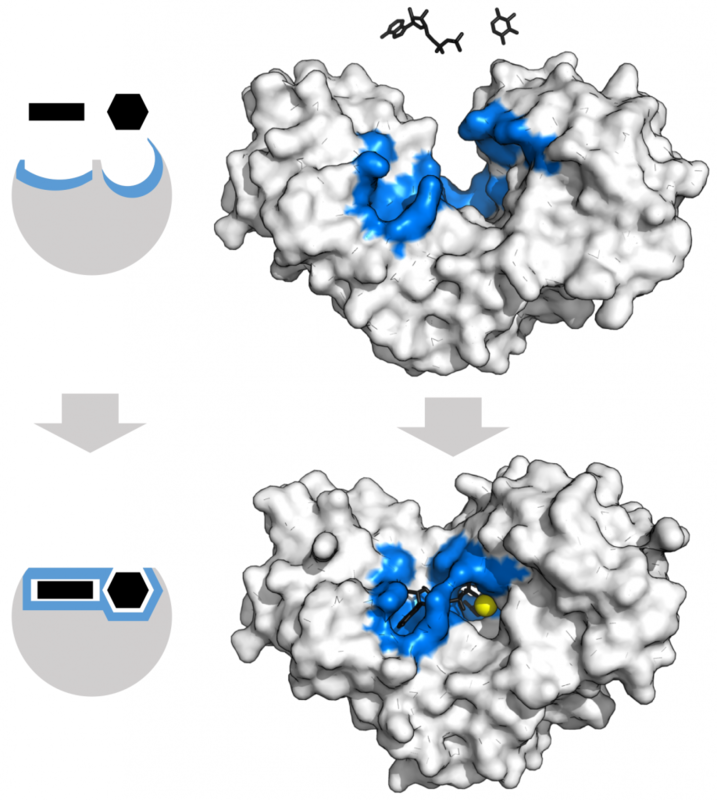 The rest of the enzyme acts as a scaffold, bringing these key amino acids together. The active site forms a cleft or crevice that the substrate can sit in during the reaction. The cleft creates a better environment for the reaction to take place. They may do this, for example, by excluding water. The active site is almost complementary to the substrate’s shape. Therefore, when the substrate binds, the enzyme must change shape slightly to fit it. This forms the enzyme-substrate complex, also called “ES”. This is the induced fit model, which is an addition to the lock and key hypothesis. Only weak bonds between the enzyme and substrate hold them in place. This is necessary to allow dissociation later on. Enzymes have an optimum temperature and pH where they work best. Changes in pH can alter critical ionization states, while changes in temperature can disrupt important bonds. Deviations from these optimum conditions will disrupt the enzyme’s structure and impact on its kinetics, eventually completely denaturing and disabling it. Fig 1 – Image of Hexokinase. The Blue region corresponds to the active site and the black molecules are the substrates. Enzymes lower the activation energy, Ea, of a particular reaction. They can do this because they have a high affinity for a transition state. The activation energy is the minimum energy needed for a reaction to occur. Enzymes assist in the reaction so that less energy is needed. This means the reaction can occur more easily. This speeds up the rate of the reaction as it allows the product to be formed faster. An enzyme has a high affinity for the transition state (even higher than for its substrate). Therefore when the substrate binds, it is quickly forced into the transition state. This is a state that exists between the substrate and the product. The enzyme is said to facilitate the formation of the transition state. The transition state has a high energy, making it very unstable. It can only exist transiently. The transition state spontaneously turns into the more stable product with lower energy. The enzyme will have a low affinity for the product and so the product is released. The rate limiting step in any reaction is its slowest step. It sets the pace for the entire reaction. After all, a production line can only be as productive as its slowest worker. In enzymatic reactions, the conversion of the enzyme-substrate complex to the product is normally rate limiting. The rate of this step (and therefore the entire enzymatic reaction) is directly proportional to the concentration of ES. The concentration of ES changes as the reaction progresses. Therefore, the rate of product formation also changes over time. When the reaction reaches equilibrium (steady state) the concentration of ES (and therefore the rate) remains relatively constant. Pre-steady state Burst of ES complexes form Slow as must first wait for ES to form. Speeds up as ES forms. (equilibrium) ES remains constant. It is formed as quickly as it breaks down. Constant rate of formation. Faster than pre-steady state. Post-steady state Substrate depletes so fewer ES complexes can form Slow as there are fewer ES complexes. Slows down as substrate runs out. The pre-steady state phase is very short as equilibrium is reached within microseconds. If you measure the rate in the first few seconds of a reaction (V0) you are actually measuring the steady state. This is the rate used in Michaelis-Menten Kinetics. 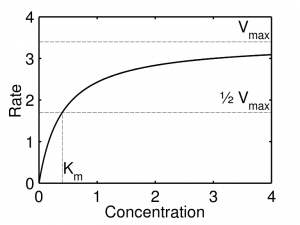 Km – the substrate concentration that gives half maximal velocity. 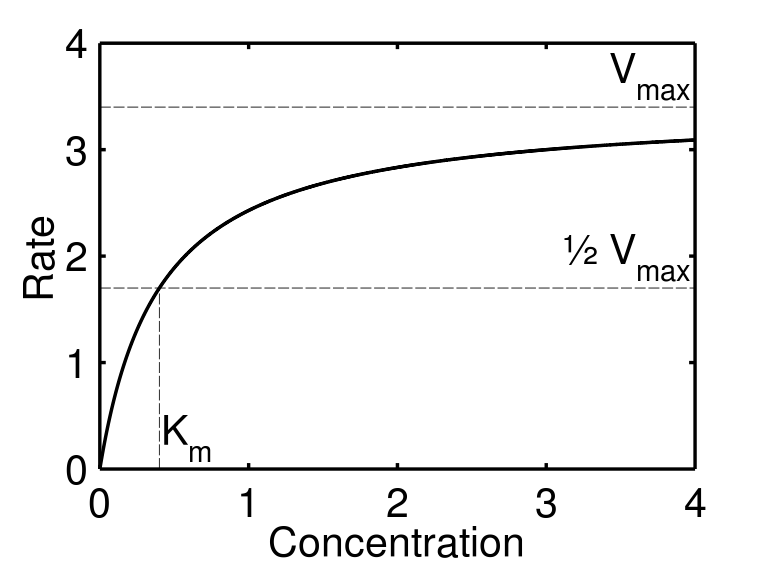 Km is a measure of the affinity an enzyme has for its substrate, as a lower Km means that less of the substrate is required to reach half of Vmax. It describes how the initial rate of reaction, V0, is affected by the initial substrate concentration, [S]0. It only looks at the start of the reaction. This allows it to ignore the reverse reaction where substrate is formed from product. This is because at the start of the reaction there is no product present to become substrate. This allows an easier interpretation of various quantities from the graph, such as the presence of an inhibitor. 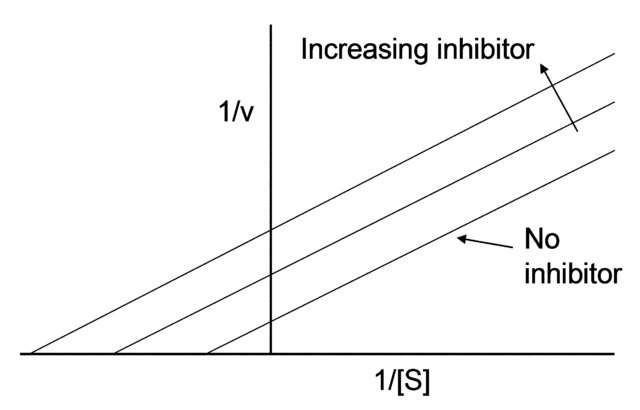 This is shown in figure 3, where an inhibitor decreases Km and therefore shifts the original line upwards. Fig 2 – image of an enzyme displaying Michaelis–Menten kinetics. Fig 3 – Image of a Lineweaver–Burk plot. Plasma enzyme assays can detect abnormal levels of enzymes in plasma. Levels may be abnormal due to leakage from damaged tissue or lack of functional enzyme production. The assay measures units of activity in a sample and so it will not measure non-functional enzyme. If levels of an enzyme are raised it may indicate damage to the tissue that enzyme is normally found in. If levels are low it may indicate that the enzyme is either non-functional, being produced slower or broken down quicker possibly due to a genetic abnormality. What is the active site of an enzyme made of? What happens during the pre-steady state? What happens during the post-steady state?